Our Medium Bare Ash tree has so many uses. Use it in winter scenes, halloween scenes, or add tiny flowers for a spring tree too! This tree measures 2.25" wide x 3.5" tall. Another great tree die, our Medium Bare Elm is a rounder shape tree. Perfect for Winter scenes, Halloween or dress it up with tiny flowers (how about using some green flower soft?) for an all-season tree. 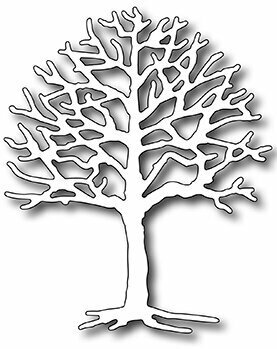 The Medium Bare Elm tree measures 2.25" wide x 2.75" tall. Designed to layer with our popular "Petite Layering Posies" die (FRA9193), the "Small Layering Posies" (FRA9555), and the "Large Layering Posies" (FRA9557) to create many sizes of layered flower. This set contains 2 sizes of the posie: 1" and 2.125". As an added bonus, the 2 dies in this set will cut out the posies from our "Pretty Posies" clear stamp set (FRAS009). Frantic Stamper Precision Dies are made in the USA. Compatible with all leading consumer die cutting machines. Happy Hanukkah! 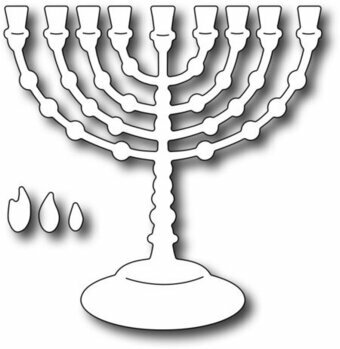 This beautiful beaded menorah measures 2.1" x 2.4" (assembled with the flames). Frantic Stamper Precision Die - Mermaid. Approx. 2" wide x 2.75" tall, this little mermaid features a sweet sitting pose. A versatile set of 8 words to honor our military veterans. The set contains several mix and match words to create cards for Memorial Day, Veteran's Day and to recognize the sacrifice made by our men and women in the armed forces. The largest word in the set (Memorial) measures 3" x 0.625". Frantic Stamper Precision Dies are made in the USA and will work with most leading table-top consumer die cutting machines. The milk can die measures 1.125" x 1.75" and is a perfect vessel for adding florals, or to use with one of the cow dies. Got Milk? Frantic Stamper Precision Die - Mistletoe. The beautifully detailed mistletoe die comes with a bow. The mistletoe measures 1.9" x 2.25" and the bow die measures 2.35" x 1". Send someone Christmas kisses with this die! Our Frantic Stamper Precision Dies work in most consumer table top die cutting machines such as the PressBoss, Cuttlebug, Big Shot, vagabond, Boss Cut, and Grand Calibur. Some dies may require the use of a metal shim depending on your machine. Frantic Stamper Precision Die - Mix 'n Match Witches' Legs. This is a super fun set of dies containing 3 leg styles and 3 witch shoe styles to mix and match. Shoes measure approx. 1" x 0.875" each, and leggings measure approx. 0.5" x 2". Idea: For a fun "witch in a cauldron" card, pair this die with the Big Cauldron die set (FRA10268). Our Frantic Stamper Precision Dies work in most consumer table top die cutting machines such as the Cuttlebug, Big Shot, vagabond, Boss Cut, and Grand Calibur. Some dies may require the use of a metal shim depending on your machine. Mixed font sentiments are all the rage. We've mixed a script large "happy" die (3.2" x 1.55") with a block font upper case "BIRTHDAY" (2.875" x 0.5"). This is a set of two dies, allowing you to place the dies where you want on your project for regular or reverse cutting. Frantic Stamper Precision Dies are proudly made in the USA from strong steel. 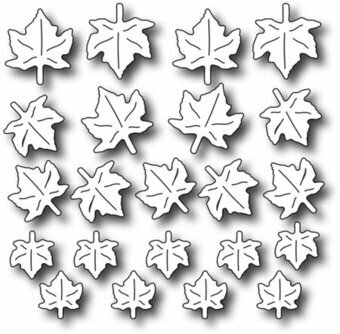 Our dies work in all table-top craft die cutting machines. The Modern Wreath die features a leafy pattern wreath measuring 3" in diameter. You also get a mod bow measuring 1.5" x 0.9". Our Frantic Stamper Precision Dies work in most consumer table top die cutting machines such as the Cuttlebug, Big Shot, vagabond, Boss Cut, and Grand Calibur. Some dies may require the use of a metal shim depending on your machine. To quote Ernie of Sesame Street, "I love my rubber duckie". This set of dies creates 3 darling rubber duckies. The mom duck measures 1.25" x 1.45" and the two baby duckies (one right facing and one left facing) measure 0.8" x 0.875". Create a row of duckies as long as you wish! Our Frantic Stamper Precision Dies work in most consumer table top die cutting machines such as the Cuttlebug, Big Shot, Vaggabond, Boss Cut, and Grand Calibur. Some dies may require the use of a metal shim depending on your machine. These three darling little alligators will make cute jungle themed baby cards. The mom gator measures 1.75" x 0.95" and the two baby gators (one right facing and one left facing) measure 1.125" x 0.625" each. Our Frantic Stamper Precision Dies work in most consumer table top die cutting machines such as the Cuttlebug, Big Shot, Vaggabond, Boss Cut, and Grand Calibur. Some dies may require the use of a metal shim depending on your machine. Our popular and versatile vignette dies now includes a MOM circle. Measuring 1.25", this die can be used alone or combined with the Round Scalloped Vignette to frame it perfectly (FRA9606). Frantic Stamper Precision Dies are made in the USA and will work with most leading table-top consumer die cutting machines. This beautiful musical staff die measures 5.5" x 2.125". 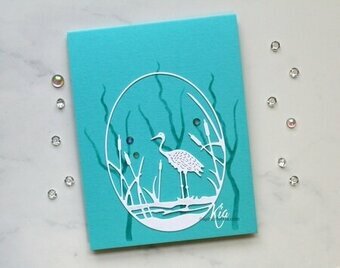 The large design allows you the option of using it as a focal point for a quick elegant card. The design can also easily be cut into smaller portions for use as accent pieces. Our Frantic Stamper Precision Dies work in most consumer table top die cutting machines such as the Cuttlebug, Big Shot, vagabond, Boss Cut, and Grand Calibur. Some dies may require the use of a metal shim depending on your machine. Create a beautiful tag or bookmark with this die. Measuring 1.9" x 4.5", it's large enough to embellish with so many things. The nested musical staff die can be used to adorn it. The musical staff measures 3" x 1". This die is perfect for creating bookmarks for your favorite bookworm, or tags to adorn your Christmas presents! Our Frantic Stamper Precision Dies work in most consumer table top die cutting machines such as the Cuttlebug, Big Shot, vagabond, Boss Cut, and Grand Calibur. Some dies may require the use of a metal shim depending on your machine. 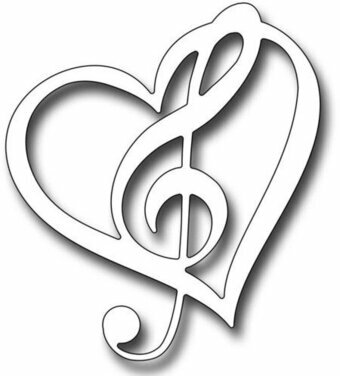 The musical heart die measures 2.1" x 2.1" and combines a wispy heart with a treble clef for a unique look. Perfect for romantic and music inspired projects Our Frantic Stamper Precision Dies work in most consumer table top die cutting machines such as the Cuttlebug, Big Shot, vagabond, Boss Cut, and Grand Calibur. Some dies may require the use of a metal shim depending on your machine. This gorgeous detailed Native American Eagle measures 3.75" x 3.25". The Eagle symbol signfies courage, wisdom and strength, as well as representing the messenger of the creator, making this a fantastic choice for making get-well cards, birthday cards and congratulatory cards. The large size is perfect for bringing this design to life with exquisite detail. Our Frantic Stamper Precision Dies work in most consumer table top die cutting machines such as the Cuttlebug, Big Shot, vagabond, Boss Cut, and Grand Calibur. Some dies may require the use of a metal shim depending on your machine. The Native American Icons die set includes four dies. The totem pole measures 1.75" x 2.875". The teepee measures 2" x 2.5", and the canoe measures 2.5" x 0.625". The last die in the set is the paddle which is sized to fit with the canoe. The detailing on the die will help you color the cuts for added interest. Our Frantic Stamper Precision Dies work in most consumer table top die cutting machines such as the Cuttlebug, Big Shot, vagabond, Boss Cut, and Grand Calibur. Some dies may require the use of a metal shim depending on your machine. Set of 2 dies. Approx sizes: Pot 1.9" x 2.25"; Cactus 2.8" x 2.25". Frantic Stamper Precision Die - Nativity Christmas Bauble. Measures 1-13/16" x 2-1/8". Use alone or with the background die FRA9294. Frantic Stamper Precision Die - Nativity Silhouette Set. 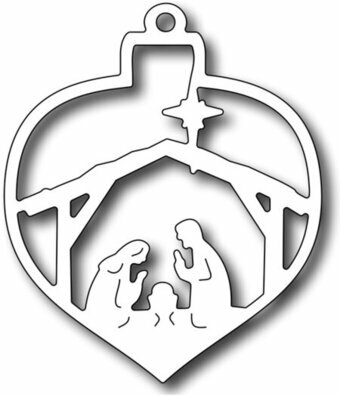 Our Nativity Silhouette set of 6 dies includes the traditional personages. Joseph (shepherd) measures 0.875" x 1.95". Kneeling Mary measures 1" x 1.3". Baby in manger measures 0.9" x 1.1". Donkey measures 1.4" x 1.25". Lamb measures 0.625" x 0.625". Star measures 0.45" x 0.6". Our Frantic Stamper Precision Dies work in most consumer table top die cutting machines such as the Cuttlebug, Big Shot, vagabond, Boss Cut, and Grand Calibur. Some dies may require the use of a metal shim depending on your machine. Frantic Stamper Precision Die - Nested Diamonds. Diamonds are a girls best friend.... well, ok, not this kind of diamond. But this kind of diamond is actually a card maker's best friend. Why? Because it's so versatile! You can create argyle style backgrounds, quilt shapes, window openings and more. This may seem like a simple set, but it can really do a lot. The diamonds measure: 2.5" x 4", 1.75" x 2.75" and 1" x 1.5". Our Frantic Stamper Precision Dies work in most consumer table top die cutting machines such as the PressBoss, Cuttlebug, Big Shot, vagabond, Boss Cut, and Grand Calibur. Some dies may require the use of a metal shim depending on your machine. Set of 6 nested stars measuring: 4.1", 3.375", 2.6", 1.875", 1.1", and 0.375". A perfect size for every project! Frantic Stamper Precision Dies are made in the USA and will work with most leading table-top consumer die cutting machines. 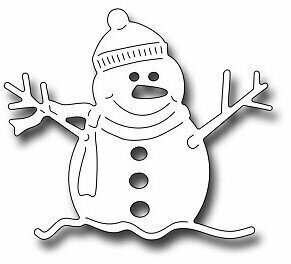 Winter is the time for snowmen! Oliver the Snowman is wearing a woolen cap and scarf. He's got the traditional stick arms and carrot nose too! Oliver measures 2.125" x 1.8"
Features a Christmas themed snowman. The Open Book die measures 2.125" x 1" and can easily be used as both a simple book or a bible. This die is perfect to create a variety of religious cards such as wedding, Christening, Christmas, sympathy, communion, faith, support in times of need, and more, but is also great for back to school, book club invitations, bookmarks, etc. Frantic Stamper Precision Dies are made in the USA and will work with most leading table-top consumer die cutting machines. This lacy open heart background die measures 3.75" x 5". It's the perfect backdrop for Valentine cards, wedding cards, and many other love related projects. Santa said it best: Ho Ho Ho! This die measures 3" x 0.9" and features 3 tiny Christmas baubles as the letters "O" in the phrase. Super cute! Frantic Stamper Precision Dies are proudly made in the USA! Our dies work in all table top consumer die cutting machines. 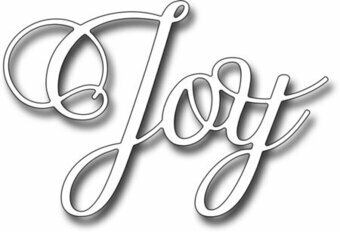 Christmas themed stamp featuring the sentiment "joy" written in ornate script. This beautiful detailed Oval Crane Scene measures 3" x 4". It's perfect for creating elegant masculine cards, as well as nature themed cards for Spring. 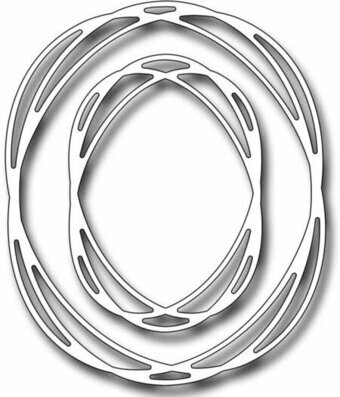 The Oval Tangled Frames is a set of 2 dies with the largest measuring 2.5" x 3" and the smallest measuring 1.5" x 2.15". The open design lends itself to many styles, from steampunk to romantic and anywhere in between. Our Frantic Stamper Precision Dies work in most consumer table top die cutting machines such as the Cuttlebug, Big Shot, vagabond, Boss Cut, and Grand Calibur. Some dies may require the use of a metal shim depending on your machine. A follow up to our popular elementals die sets, this grouping features a large (4" x 5.25") outer frame die featuring a fine detail filigree pattern, plus 6 nesting ovals (2.625" x 3.5"; 2.25" x 3.25"; 1.875" x 2.5"; 1.5" x 2"; 1.125" x 1.5"; and 0.75" x 1"). Note: these dies will need to be cut apart for use. Measuring 2.25", the Pacifier Square is a great way to make quick tags, darling shaker cards, or super quick baby cards. The pacifier can also easily be trimmed from the frame if you wish to have a large pacifier die cut. Our Frantic Stamper Precision Dies work in most consumer table top die cutting machines such as the Cuttlebug, Big Shot, Vaggabond, Boss Cut, and Grand Calibur. Some dies may require the use of a metal shim depending on your machine. Our palm tree edger features two sets of palm tress joined by a curvy border to easily simulate a beach or desert edge. The die measures 5.5" long x 3.5" high. With this die, you can easily create a summery scene on a landscape orientation card, or use just a portion for a portrait orientation card. You can also cut the design in half or use only the palm trees. Frantic Stamper Precision Dies work in most consumer table top die cutting machines such as the Press Boss, Cuttlebug, Big Shot, vagabond, Boss Cut, and Grand Calibur. Some dies may require the use of a metal shim depending on your machine. With a classic Art Deco font, this word die uses the Eiffel Tower as the "A" in "Paris". It measures 3.25" x 1.8". Frantic Stamper Precision Die - Peeking Penguins. This set of three jolly penguins are peeking from their little windows. Each die measures approx. 1.25" x 1.5". Create fun small shaker windows, perfect for tags too! Our Frantic Stamper Precision Dies work in most consumer table top die cutting machines such as the PressBoss, Cuttlebug, Big Shot, vagabond, Boss Cut, and Grand Calibur. Some dies may require the use of a metal shim depending on your machine. The Performing Elephant die comes in 2 pieces. The elephant measures 1.375" x 2.75", and the ball measures 0.9" in diameter. This die is great for children's birthday cards, as well as circus themed projects. Create dozens of sakura flowers fast with the Petite Sakura die. The die itself measures 3.25" square, and the actual flowers are sized 0.375" to 0.75". The flowers can be shaped with a shaping tool, shaded with markers or pencils, and layered for dimension and detail. Our Frantic Stamper Precision Dies work in most consumer table top die cutting machines such as the Cuttlebug, Big Shot, vagabond, Boss Cut, and Grand Calibur. Some dies may require the use of a metal shim depending on your machine. Tickle the ivories with this fantastic Piano Keys Edger die. The die measures 5.5" long x 2" deep, and features a beautiful soft curve. Create elegant music themed cards with this fantastic die! Our Frantic Stamper Precision Dies work in most consumer table top die cutting machines such as the Cuttlebug, Big Shot, vagabond, Boss Cut, and Grand Calibur. Some dies may require the use of a metal shim depending on your machine. Frantic Stamper Precision Die - Picket Fence (set of 3 dies). This set of 3 dies features a fence section (2.3" x 1.2"), a gate (1" x 1.2") and a post (0.25" x 1.5"). Add our grass edger (FRA9372) and our Wildflower Edger (FRA9371) and you have the start of a beautiful garden scene. This simple pinecone die measures 1.25" x 1.25". It has cut lines which allow you to add dimension to the design. We recommend pairing this die with our Pine Bough die (FRA9281). Frantic Stamper Precision Dies are proudly made in the USA! Our dies work in all table top consumer die cutting machines. Featuring a classic elongated shape, this Christmas themed "pinecone" ornament background die measures 1.375" x 2.75". The set also contains a simple string bow measuring 0.875" x 0.625", and an ornament hook measuring 0.4" x 1.2". This set of 4 pinprick circle dies is so versatile. Notice that we put pin holes on both the inside and outside of the circles. Why? Simple... you can cut a circle from your card front and have not only a round window, but with cute tiny holes already done on the outside! The resulting cutout circle will also have the little pin holes already done. Use the pin holes to add real stitching or faux stitching that is always even. Here's another idea: tape 2 circles to your cardstock (evenly spaced one inside the other), run through the machine and now you have a round frame with double pin hole lines! These little holes are perfect left alone, or use them as a guide to run a zig zag stitch or cross-stitch to the frame. Let's not forget that the 2nd smallest circle is also a nice size to use with our round vignette stamps and dies. Bonus!! Sizes of the circle cut lines are: 3.25"; 2.5"; 1.75"; and 1". Frantic Stamper Precision Dies are proudly made in the USA! Our dies work in all table top consumer die cutting machines. 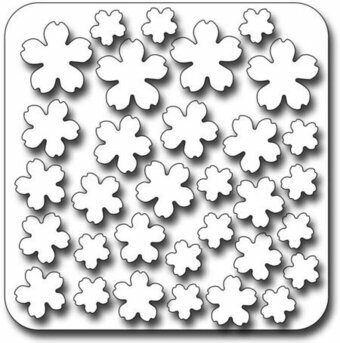 Frantic Stamper Precision Die - Pinprick Snowflake Background. This die is not like any other. It does not cut any design. Instead, it creates a very subtle pin dot snowflake pattern into your paper. The die measures 3.75" x 5.25". Although the pattern is subtle, and perfect for white-on-white work, it can be enhanced with rubbing wax to bring out the design. Our Frantic Stamper Precision Dies work in most consumer table top die cutting machines such as the PressBoss, Cuttlebug, Big Shot, vagabond, Boss Cut, and Grand Calibur. Some dies may require the use of a metal shim depending on your machine. Ya wanna pizza me? Sure!!! This generously sized (2.75" x 3.5") slice of pizza includes pepperoni, olive, mushroom, bell pepper, and even pineapple pieces to really customize your pie just the way you like it. Our Frantic Stamper Precision Dies work in most consumer table top die cutting machines such as the Press Boss, Cuttlebug, Big Shot, vagabond, Boss Cut, and Grand Calibur. This is such a fun die, and great for making cards for all your sewing friends, mothers, grandmothers, etc. It's also perfect for making wedding cards, prom cards and more. The dress features 3 bodice styles, and folds along the dotted lines. 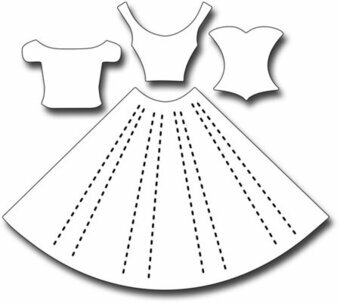 The assembled and folded dress measures 2.25" x 3.5". Our Frantic Stamper Precision Dies work in most consumer table top die cutting machines such as the Cuttlebug, Big Shot, Vaggabond, Boss Cut, and Grand Calibur. Some dies may require the use of a metal shim depending on your machine. This is our second set of Pop-Up dies. These dies contain pieces to help you build pop-up cards, and even a wobbler spiral piece! Frantic Stamper Precision Dies are made in the USA and will work with most leading table-top consumer die cutting machines. Jasper is a playful pup.... and he can be posed in many different ways since his parts are all separate. Assembled, he measures approximately 3" x 2.5" depending on the pose of your choice. Jasper is fun to color with large pieces giving you plenty of room for shading. Made in the USA with 100% stainless steel. Our Frantic Stamper Precision Dies work in most consumer table top die cutting machines such as the Cuttlebug, Big Shot, Vaggabond, Boss Cut, and Grand Calibur. Some dies may require the use of a metal shim depending on your machine. Potions, lotions and elixirs will feel right at home in this set of 7 dies which includes 3 bottles (0.75" x 1.125", 0.9" x 1", and 0.55" x 1.25") as well as 3 tiny labels (0.5" to 0.625") and a smoke plume (0.75" x 1.4"). They're perfect for mixing your eye of newt for that special Halloween concoction. Frantic Stamper Precision Dies work in most standard table-top die cutting machines such as the Big Shot, Vagabond, Cuttlebug, etc. Our dies are made in the USA. Our set of Pots and Pans is a 3-piece set including: Pot: 1.25" x 0.8" (think outside the box on this one.... Michelle from our Design Team cut off one of the handles and used it as a mug!). Pan: 1.4" x 0.375", Lid: 0.875" x 0.35". Frantic Stamper Precision Dies are made in the USA and will work with most leading table-top consumer die cutting machines. With her butterfly wings, and holding a butterfly, this beautifly fairy measures 1.8" x 3.25". We recommend our Fairy Wishes clear stamp set for coordinating fairy sentiments (FRA032).